Crunchy : The name says it all. It�s crisp and crunchy as you take a bite on. 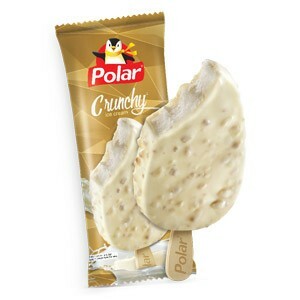 With the mouthwatering taste of Toffee, this ice cream will surely melt your heart every time you take a bite on. Rich in energy and nutrition, this ice cream is always a perfect pick. Ingradiants: Milk solids, Milk Fat, Vegetable fat, Sugar, Liquid Glucose, Stabilizer, Emulsifier, Food Flavor and Color, Toffee Coating with Crisp and Water.